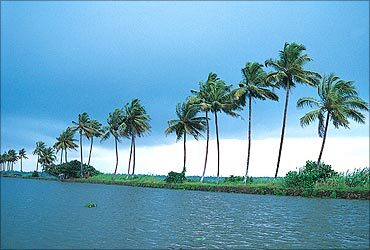 The much-awaited South West monsoon has hit the Kerala coast. The showers are a blessing for the country, which witnessed the warmest year in 108 years. With the meteorological department forecasting a normal monsoon this year, there is optimism for India's trillion-dollar economy. After last year's drought, (though a normal rainfall was predicted) this year's 'normal' monsoon would help boost the agricultural output and bring down the rising inflation. The monsoon accounts for 80 per cent of the rainfall in India. Even if the monsoon is delayed by few days, it can have an adverse effect on the economy as about half of India's farm output comes from crops sown during the June-September rainy season. Monsoon is a key to determine agricultural output, inflation, consumer spending and overall economic growth. While a normal rainfall signals growth and prosperity, a below normal rainfall could spell disaster making food more expensive, aggravating the power, water shortage, hitting industrial production which in turn will put more pressure on the government's kitty. M S Swaminathan said recently, the "Future belongs to nations with grains, not guns." 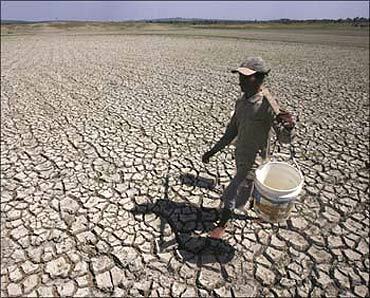 India is expected to receive 98 per cent of the average rainfall during the 2010 south-west monsoon. This is good news considering that the gross domestic product (GDP) has risen to 8.6 percent in the first quarter compared to the same period last year. A normal rainfall will further stabilise growth and development. The Indian agriculture, which accounts for 17-20 per cent of the GDP is largely dependent on the rains. So a fall in agriculture has a ripple effect on the economy. A good monsoon will boost the ailing agriculture sector, resulting in bumper crops, bring down the prices of vegetables, cereals and essential commodities. It will remove the export ban on several commodities and reduce the country's dependence on imports. As for investors, a normal monsoon can positively impact the stock markets too. It will boost hydroelectric industries and improve the power situation. Raw materials for the industry will get cheaper. Monsoons thus act as an economic lifeline for India. 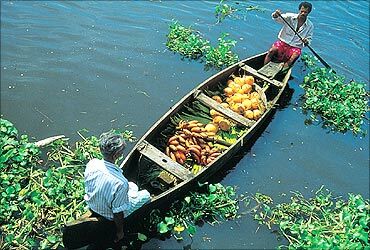 Image: Fram sector to boom if it is a normal monsoon. The agriculture sector recorded the lowest growth in five years, at 0.2 per cent, in fiscal year 2009-10 due to widespread drought. Agriculture and its allied sectors had grown at 1.6 per cent in 2008-09. Finance Minister Pranab Mukherjee said in the third quarter, monsoon had adverse impact on agriculture. However, crop yields have been revised. The sugarcane production estimates is revised to 274.66 million tonnes from the earlier projection of 251.27 million tonnes. Cotton output estimates improved to 22.83 million bales, from 22.31 million bales of 170 kg each. India being a top producer and consumer of wheat, rice, sugar and edible oils, its harvest in India impacts global markets as well. 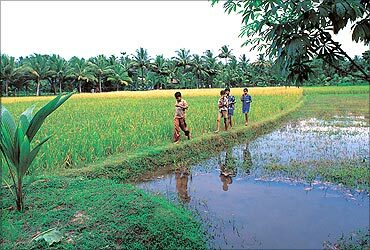 The weak monsoon hit farm production mainly in the third quarter of the last fiscal, as it declined by 1.8 per cent. In 2008-09 also, farm production had contracted in the third quarter - by 1.4 per cent. Image: Famr sector hit by drought. India is the second largest producer of rice and wheat in the world. However, last year, a lack of normal rainfall led to a rise in prices of agricultural products. Food prices in India have stayed above 15 percent since November after monsoon rains last year were the weakest in almost three decades, leading to a shortage in rice and wheat. 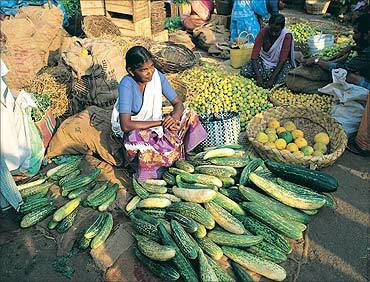 India's food inflation rate stood at a high of 16.23 per cent for the week ended May 15. A normal monsoon this year may help lower inflation. Food prices in India have stayed above 15 per cent since November after last year's poor monsoon, the worst in four decades, hitting sugar, rice and wheat harvest. The country experienced its driest June last year in 83 years. With 75 per cent of Indians directly or indirectly dependent on agriculture, each and everyone in India looks forward to the monsoon season. About 60 per cent of the population depends on agriculture for livelihood. A normal monsoon would help the government lift a ban on wheat exports in effect since 2007. The rural economy contributes about 40 per cent to GDP. Good rains will also boost the output of several commodities, reducing the burden on imports. Most of the FMCG companies depend on the rural market as villagers account for two-thirds of India's booming population. A good monsoon increases their purchasing power whereas a drought can lead poor income and an additional burden on the government coffers with an increase in subsidies for the poor. Image: Rural economy to benefit the most. A fall in rainfall leads to shortage of water supply for production of power and electricity. Electricity shortage has an adverse effect on all sectors of the economy. A rise in rainfall can bring power to thousands of households and small factories across India. Currently, about 26 percent of installed power generation capacity in India is based on hydropower. 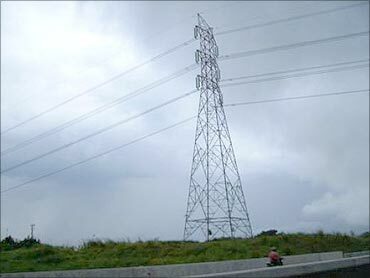 The limited addition, fall in hydropower generation in south India and higher demand for electricity in summer have resulted in a severe power crisis. India Inc lost Rs 43,205 crore (Rs 432.05 billion) in 2008-09 due to power outages. India has a 12 per cent power shortage during the peak hours between 5 pm and 11 pm. The monsoon rains are thus vital for hydropower generation across the country. Image: Power crisis across India. Bihar and Uttar Pradesh, which contribute to about 16 per cent to India's agricultural GDP have been the worst hit by the erratic rains. People across the country are facing the brunt of massive power cuts and water shortage. The places worst hit are Punjab, Haryana, Delhi, Himachal Pradesh and Chandigarh as the water level in the Bhakra Nangal Dam has fallen drastically. Bihar, Uttar Pradesh, Andhra Pradesh and Rajasthan, These states have pitched their hopes on the monsoon. In Andhra Pradesh, at least three-fourths of the 1,100 mandals have reported deficit rainfall. 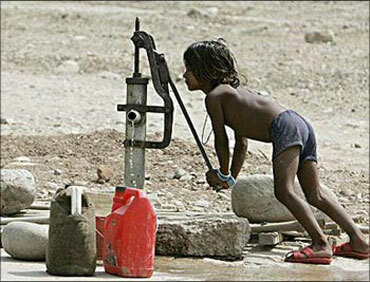 Image: A child at a water pump in Bihar. Kolkata has enough water, yet there's a problem!